Clear Glass/Crystal? 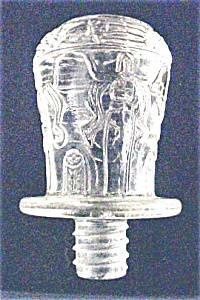 cut glass designs of woman with flowing hair. Intricately designed. Measures : 2-1/4 Inches H x 1-4/8 Inches W at the lip portion. The bottom has a screw like stopper which is 1/2 Inch H x 1/2 Inch W. The 1/2 Inch H of the screw portion is included in the 2-1/4 Inches H of the complete measurement of this piece. Condition: Fair to Good. Condition issues: There is what appears to be 2 scratches or cracks on the design portion, which can be seen with a magnifiying glass. There are also several very tiny chips at the end of one of the cracks/scratches, several flea bites on the lip and several chips on the screw portion. But all in all the piece is very solid. You have to really look very closely to see the condition issues.